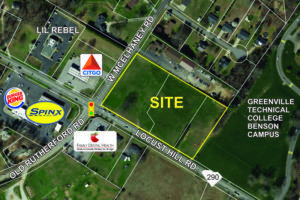 Property at the corner of Locust Hill and W. McElhaney sold – LANGSTON BLACK REAL ESTATE, INC.
Tim Allender of Langston-Black Real Estate, Inc. represented Greenville Tech Foundation in the recent sell of their 4.6 acres of property located at the corner of McElhaney & Locust Hill Roads. Chuck Langston, CCIM, also with Langston-Black Real Estate represented the Purchaser, Locust Hill Partners, LLC. The land was purchased with future development in mind.